Shortly after publishing my piece on shifting to a three-row, I got the following e-mail from Troy Bennett, of Mystery Jig Studios. Long time, no-see. How’s the new three-row Baffetti treating you? Currently, I’ve got a three-row, three-voice, 12-bass Beltuna in A/D/G on spec from the Button Box. It’s a far cry from the two-voice Saltarelle Bouebe I’ve had since last fall. The Beltuna is much more mellow and creamy. The action is better and it’s heavy at about 16 pounds. The Bouebe is more brash and light. I’m torn. I’m also fumbling over the extra set of buttons on the bass side. I’m finding the Beltuna a bit intimidating. I certainly don’t play well enough to really justify such a magnificent instrument. But, I feel like I might, some day. But I’m drawn to the light little Bouebe, too. It’s very unpretentious. Will I ever get used to all the bass buttons? Is a three-row really that much better than a two-row? Is the extra weight justified. And I have to decide by Monday! Eeek! 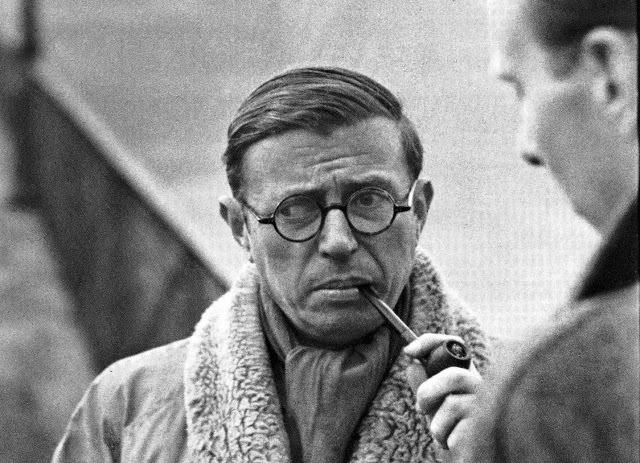 Thinking about accordéons, Mr. Sartre? Hey, congratulations on the dilemma you’ve placed yourself in! “What should I do?” you ask. I’m pretty sure I’m the wrong one to ask, being as I’m besotted by my Baffetti. According to Sartre, when you go to a priest for advice, you’ve already decided on the advice you want to get. Letting it into your living room may have been a mistake! Is the three-row better than the two-row? Of course, not … not in any intrinsic sense. It depends on what you want to do. I am absolutely loving my three row. I’ve been fascinated by the three-row for years, wanting to try one out. And the opportunities it offers me (playing for singers and with other instruments) and the challenges are already making me a better musician and engaging me thoroughly. I worried that I might be sacrificing some of the “melodeon-ness” by moving away from the two-row, but that hasn’t been the case. I don’t know if you know Andy_from_Vermont, but he plays a ton of Irish and Contra on his ADG. The thing about the three-row is that it does promote a more fluid way of playing, and offers more opportunities for right-hand chords, and it does give you that extra key (and A is pretty common in the Celtic/Contra world). But you can play up and down the rows and get the push/pull people like. The extra weight is such that it doesn’t slow play (especially if you play while sitting). You WILL acclimate to the extra bass buttons. Really. You will. Bethany, reading over my shoulder, recommends that you examine your three year growth plan, if you haven’t already: How do I want to grow musically in the next three years? Will this instrument challenge me in a way that is enjoyable? These are the questions she asked me when I talked about investing in the Baffetti … even though it ended up being an even trade for the Nik. Also, I had to make adjustments to the straps to make the Baffetti sit well with my body and its various back aches, etc. Obviously, i can’t tell you what you should do. William James posited that the right-ness or wrong-ness of a philosophy depends more on the temperament of the philosopher than the truth of the philosophy. The fact that you worry that it might be “pretentious” might point to some required self-examination on your part. Are you worthy of this beautiful thing? Of course. Hope this is helpful, but suspect not. P.S. what made you consider a three-row in the first place? I decided to have a go at the big A/D/G, like Hillary, because it was there. I was perusing the Button Box website and it looked like a good deal and sounded great in the video. The price seemed more than fair. I’d be wanting to get a G/C, really, because I wrote some words to La Marianne and G is too high to sing them in. D is actually a better key for the song and French tunes sound better on the A row that the D row of my current box. I guess it was a bunch of factors, really. But, when I got it, it seemed very heavy. I wondered if it’d just end up sounding like a piano accordion what with its three reeds and extra buttons. I’m not a very experienced player, so working with the extra four bass buttons feels like it’s setting me back months. However, I believe you when you say it’ll come. When I first started on the two row, I didn’t think I’d ever get the 3/4 time right on the bass side. But I did. I’m already better with these 12 buttons than I was two days ago. It’s a bit frustrating, though. The best piece of your eloquent advice/warning is the bit about the three year plan. That makes sense. Will this instrument take me, or can I take it, where I want to be in three years? Yes, I think so. Also, saying that Andy in Vermont plays contra with his is nice to hear. I’m very much interested in the New England repertoire, pre-Celtic tiger. You know, before the 1990’s when everyone started playing as fast as they could with as many grace notes a s humanly possible? 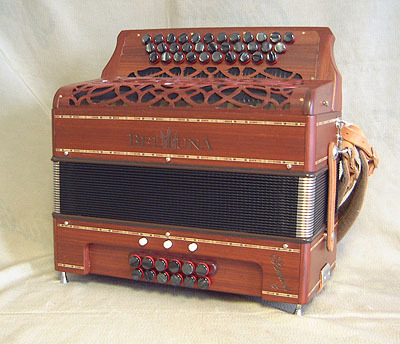 So, yes, I think I’ll keep it and trade in the little Bouebe so I can actually afford the Beltuna. Thanks for being there in my weak moment. Next Post Download my new CD! The quote about Everest “being there” is attributed not to Hillary, but to George Mallory. He perished in the attempt. I don't think you need fear that the 3-row will kill you, Troy, but let me wish you good luck scaling its heights! You're quite right, of course. In my defense, though, I was dashing off an email not originally meant for publication or fact-checking. But thanks for keeping the record straight. Hopefully, if the three-row does me in, you'll all find my body before 75 years go by!